After earning a B.A. in Latin American Studies at UCLA in 1996, John Arboleda built a career in higher education in the U.S. and Europe. He now serves as director of special projects & innovation at Instituto Europeo di Design in Barcelona and runs a consulting company based in Spain. This article is part of a series published in advance of International Education Week 2018 (Nov. 13–16, 2018) that illustrates the educational and career benefits of international experience — whether travel study, study abroad or international internships — among UCLA students and alumni. This interview is based on a video interview with Mr. Arboleda and subsequent conversations with him. UCLA International Institute, November 7, 2018 — As a first-generation student at Cerritos College in Norwalk, California, John Arboleda thought UCLA was beyond his reach. Then he met a recruiter at a college fair who encouraged him to apply to UCLA as a transfer student and enroll in its Latin American Studies program. Over the next two years, John dove into his major, perfecting his Spanish and learning Portuguese. “My reasons for choosing Latin American Studies probably go back to my own background,” he says. “I'm a son of Colombian immigrants, so being raised bi-culturally in Southern California, I realized that I had this other part of me — this Latin American side of me — that I really didn't understand. “Being able to learn about Latin America through my professors, the coursework and the lectures was really great,” says John. “I think in many ways, I was already having a study abroad experience, but from the comfort of the UCLA campus.” But he took his studies one step further and spent a semester in a UC Education Abroad Program in Argentina and Chile, the first of many travel experiences that would expand his world and broaden his outlook. After graduating from UCLA, he began his professional life working for the University of California Office of the President in its San Joaquin Valley office. There, he led community college outreach and admissions efforts representing all UC campuses and laying the groundwork for what eventually became UC Merced. He then continued his work in community colleges in California, leading bridge programs that helped under-represented students discover and gain access to higher education. “I call those my ‘access years,’” remarks John, “when I was focused on helping students and diverse communities across California and Southern California gain access to a university education.” Following those positions, John completed the Coro Fellows Program, a prestigious fellowship program in leadership and public affairs that operates across the nation. Plans to attend graduate school at UCLA were, however, upended by an independent travel journey of six months. “I returned to South America for two-and-a-half months,” he explains. “After that, I went to Europe for the first time and I spent two-and-a-half months in Europe in Spain, France and Italy. And then I ended the journey by crossing the United States for one month. “During that time, I had an epiphany,” he recounts. “I realized that I wanted to live and work in Europe and I didn't know how that was going to happen. That's also the time in my life when I started listening to what feels right and not always to the ‘right thing to do’ — what other people expect you to do,” he relates. “I actually took the road map that I originally had (graduate school at UCLA), threw that out the door and had an unchartered map for how I was going to navigate my life to live and work in Europe,” he says. Within a few years, he moved to Germany — a country that, like the entire idea of living and working abroad, had never been part of his plans as a college student. John also met his Italian wife in Germany, where his son was born. 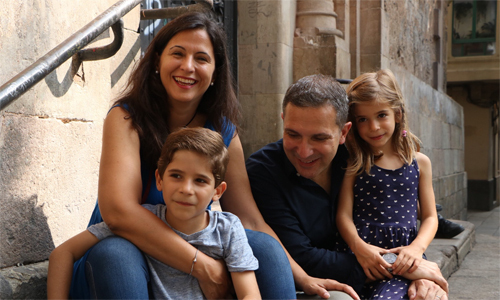 After a few years, the couple sought out a sunnier climate — John comes from Southern California, and his wife, from Rome. They settled on Barcelona, Spain, where his daughter was eventually born. The experience of working in leadership roles across the student-to-alumni life cycle in order to develop and implement global strategies was an entrepreneurial experience. Continuing in that direction, John became an entrepreneur in fact and launched Not On Your Own (NOYO) in Barcelona in 2013. The consulting company advises educational institutions and companies, mainly in Europe and Latin America, on how to develop integrated engagement strategies by applying service design and design thinking. 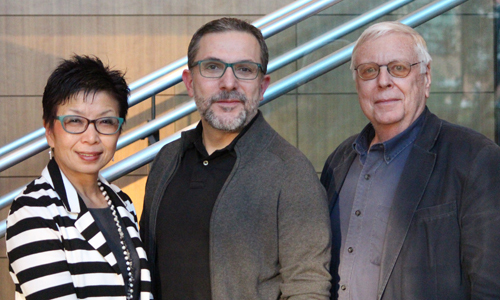 In addition to NOYO, John recently joined Instituto Europeo di Design (IED) Barcelona, where he leads innovation and special projects for one of Europe’s leading design schools, while continuing to advise NOYO clients. A member of the UCLA Alumni Association Board of Directors since 2015, he is also an active contributor to global engagement strategies on campus. John is currently collaborating with Professor John Dagenais of the Spanish & Portuguese Department, the International Institute and other UCLA units to enhance the impact of the study abroad experience. The idea is simple: link Bruins in EAP and travel study programs in various countries to UCLA alumni in those countries. As you might gather by now, this is a not man who hesitates to put ideas into action. 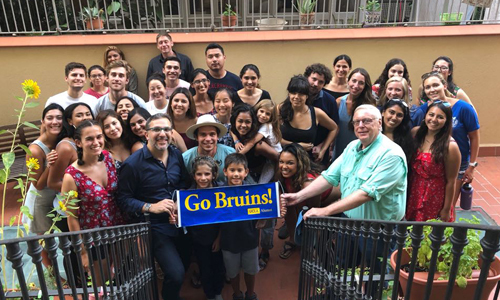 Last summer, he hosted 27 undergraduate students participating in a UCLA travel study program led by Professor Dagenais at his home in Barcelona. Meeting a UCLA Alumni Association board member who lives in Barcelona allowed students to see that UCLA extends beyond Los Angeles, says John. “They could also see how the International Institute, the Travel Study program, a professor and an alumnus can collaborate together to co-create a much more meaningful and impactful experience for our UCLA students,” he observes. “My advice to a student who wants to pursue an international career is to go study abroad. That’s a big plus that leads to developing one’s global IQ. Employers are seeking talent with international experience” says John. “It’s a transformative life experience that will produce multiple benefits and tangible value, personally and professionally, long after you've graduated from UCLA,” he insists. And although students may feel more comfortable with their peers in a travel study or study abroad program, he advises them to push beyond their comfort zone. “You have to depart from that group to find and be able to immerse yourself in your own individual abroad experience, in and outside the classroom, with locals who are from that country,” John explains. “That means building a separate social base, perhaps among foreign students you will be working or collaborating with, and broadening that experience. Because that is where there is another, deeper level of study abroad experience — more than one can imagine,” he says. Research is equally important. “What are the professional possibilities that you have? What are the types of careers that exist or are emerging? What trends are happening, so you can align your educational interests, and your passions, with to your professional goals?” he asks. Ultimately, he laughs, “You just have to believe and go for it. There will be a lot of challenges, a lot of unknowns. There is no clear path on how to have an international career. "You may do it by pursuing a master’s degree overseas, you may do it through working for an NGO or a government organization or a company that will send you abroad,” he says. “Or you may do it my way. I’m kind of a grassroots expat — I just went to Europe and developed my life there.